Fire damage, water damage and flood damage can arise from a big emergency. 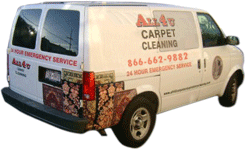 At All 4 U Carpet Clean, we offer emergency cleaning service twenty-four hours a day, seven days a week (24/7). Call us immediately and we will have a highly trained specialist come to your home to start the restoration process. All 4 U Carpet Clean specializes in water extraction and removal, rapid drying of damaged property including walls, thoroughly cleaning damaged areas, mildew treatment, and removing odors by disinfecting and deodorizing your carpet or any other damaged property. We will take every step necessary for the clean, safe and thorough restoration of your home in the event of such an emergency. Water damage never comes at a convenient time. Any time, day or night, All 4 U technicians are here to service your needs. All 4 U can take care of your water damage problems.